Welcome home to Harbour Isles in sunny Apollo Beach! This well-built home by K. Hovnanian, boasts a quiet cul-de-sac setting in a QUALITY COMMUNITY. The sprawling homesite is 84x137 and offers POND AND CONSERVATION VIEWS. This home is powered by SOLAR PANELS that absorb and convert sunlight into electricity, which means LOWER ELECTRIC BILLS. Enjoy beautiful features such as a stunning double door entrance, soaring ceilings, ceramic tile on the diagonal, elegant 42 cabinets and sleek granite countertops in the kitchen. This home offers a wonderful, open layout that includes a 3-way split with generous bedrooms, a den/office with French doors, formal dining room, huge family room thats open to the roomy eat-in kitchen. The master bedroom is especially cozy with faux-wood blinds, double walk-in closets, and a spa-like ensuite bath. The 4th bedroom and private bath are perfect for guests or a second master. Other features of this incredible home include an irrigation system and an EXTENDED, SCREENED LANAI that overlooks a pond and the community walking trail. NO BACKYARD NEIGHBORS! 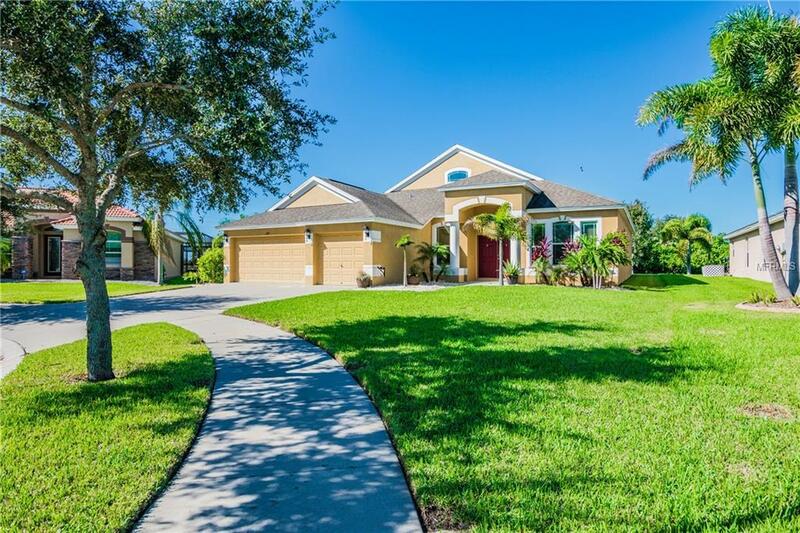 Location is key with this home being only a few minutes away from Apollo Beach, Little Harbor, E.G. Simmons Park, tons of new restaurants and shops, and is just a short distance from I-75. This home delivers the fantastic Florida lifestyle. Harbour Isles offers wonderful amenities like a community pool, sports courts, fitness center, walking trail and more. Price lowered recently to offset CDD fee.